If your vehicle won’t start, chances are there’s a problem with your starter, alternator, or battery. If you turn the key and nothing happens, check to see if your interior lights are at least one. If this is the case, the problem is likely the alternator. If the lights aren’t working and the car won’t start, it may be a dead battery. If you hear a clicking sound when you turn the key it is likely the starter. However, all these issues require further diagnoses and a visit to our auto shop. Can you not see what speed you are traveling at during the evening? Is it hard to see the gas gauge? We recommend scheduling an appointment to get this taken care of as soon as possible. In the meantime, carry a small flashlight with you and place it on top of your dash to light up the speedometer so you’re able to safely make it to your destination. 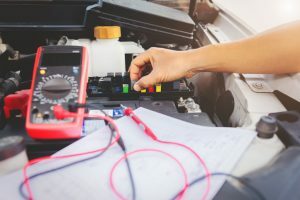 If you notice that your dashboard lights or headlights dimming when you are driving or when the car is idling there may be a problem with the battery, alternator, or even the voltage regulator. Stop by so we can confirm the issue for you. Have you replaced your headlights or taillights and they still do not function properly? You may need a new fuse. We are happy to help you diagnose the root of the issue quickly. No matter the issue, when you need an “auto electrical mechanic near me” give Johnny’s Auto Service a call for an experienced team of ASE Certified Technicians who offer the highest quality of service! We’d be happy to complete all car electrical repair for West Covina drivers!